2016 Schedule and Thank You! I would like to thank everyone for their support in 2015, Oregon Pelagic Tours's first year of business. Even with two cancellations (neither deepwater trip made it out), we took 186 people out onto the Pacific Ocean. If you went out with us last year, or would like to come out with us in 2016, our schedule is now available on our website. For more information, please go to our Schedule & Prices page. 20 birders and 5 guides had very nice ocean conditions as we made it out 31 miles on this 7 hour pelagic. Our trip started with a good bird early, as we picked up a a single Long-tailed Duck hanging out in the bay with Bufflehead and numerous loons and grebes. We managed poor looks at Marbled Murrelets south of the jetty, then headed offshore. We stopped for a large flock of birds over bait fish nine miles offshore, and were rewarded with excellent looks at Short-tailed Shearwater. Distinguishing between this species and Sooty Shearwater is an under-appreciated identification problem, and as a result, we left many individuals in the unidentified category. The rest of the day, we worked hard for our birds, as shown by our single Black-footed Albatross, which came to investigate our chum slick. We did see another target species, Ancient Murrelet, but most of us had to settle for distant views. Black-legged Kittiwakes put on a good show, as did Northern Fulmars, , and we had views of Rhinoceros and Cassin's Auklets, an intriguing murre thought by some to be a possible Thick-billed, and several gull species. The wind waves settled down as we headed back in, and we arrived at the dock satisfied with our November pelagic. 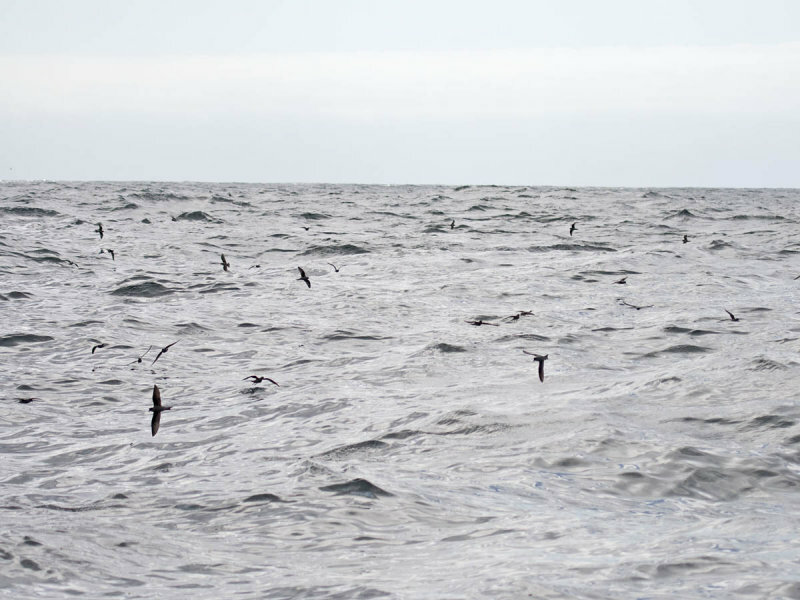 Most storm-petrels intersperse flapping flight with brief glides, low along the water. Darting direction and speed changes are frequent in many species. The flight style will change with wind speed and bird activities. Some storm-petrels have noticeably different flight styles depending upon whether they are engaging in commuting flight, meandering foraging flight, or actively feeding. It is not always possible to identify absolutely a storm-petrel by flight style alone. 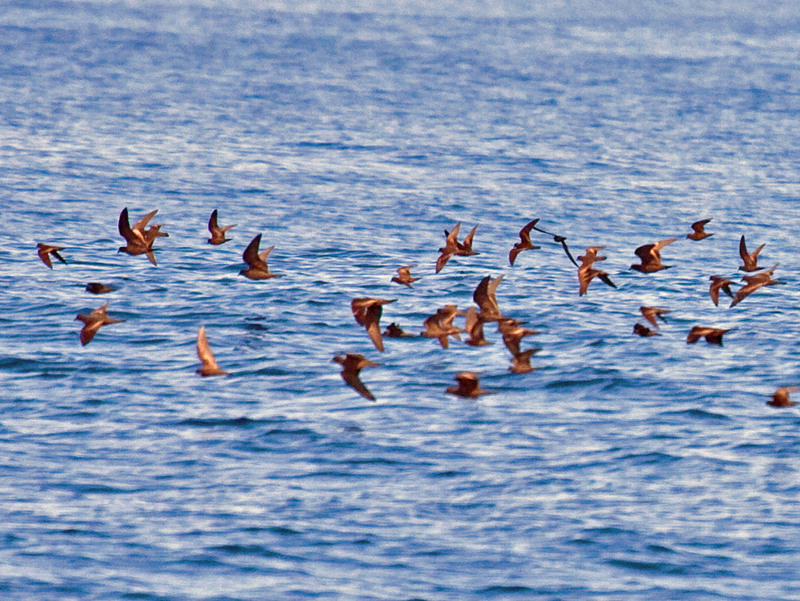 The goal should be to pick out any storm-petrel flying distinctively differently than the others around it. Then concentrate on the identification of this different bird. Fork-tailed Storm-Petrels. Off Newport, Oregon. October 2, 2010. Greg Gillson. Fork-tailed Storm-Petrel: Most commonly encountered storm-petrel from 10 to 50 miles offshore from northern California to Alaska. Less common in central and southern California. Medium size. Wings are fairly straight and slightly rounded at the tips. Tail long and forked. Commuting flight can be rather direct with shallow rowing strokes (Stallcup 1990). Foraging flight is erratic, with medium to shallow wing strokes interspersed with floppy, moth-like, deeper strokes. These birds unpredictably change flight speed and direction. The flight is interspersed with brief banked glides. Feeding, the bird hovers in place with deep high wing strokes. It also faces into the wind and hangs in place on outstretched wings set in place. As it feeds it constantly pushes off the water with its feet, dangling the legs down and foot-pattering along. It then leans forward while hovering to pick at food on the surface. Leach’s Storm-Petrel: Common primarily from 50-200 miles offshore all along the West Coast. Rarely seen closer to shore during daylight. Large size. Wings are long and pointed, held forward at the wrists and bent back at the tips. Tail long and forked, most noticeable when spread during banked glides. The flight characteristics are essentially unvarying regardless of activity or winds. The flight is bounding, veering, and zigzagging on stiff, bent wings. “Ricocheting” (Stallcup 1990). Characteristic zigzag flight includes quick, deep, double-flaps followed by brief glides with wings held slightly above the horizontal. This flight bears more than a passing resemblance to the flight of Common Nighthawk. Flight also includes brief glides on bowed wings held slightly below the horizontal. Feeding, flies low to the water in typical flight. During short glides with wings held slight above the horizontal it quickly picks food off the water before veering away. Sometimes feeds by hanging briefly in wind just above water’s surface with a bit of foot-pattering, but rarely hovers in place to feed. Black Storm-Petrel: Most common storm-petrel in California, ranging from northern California southward. May be seen occasionally from shore. Large size. Long, pointed wings. Long, deeply forked tail. Commuting flight fairly smooth and direct with deep, slow, graceful wing strokes, interspersed with glides. Reminds some of flight of Black Tern. Feeding, flaps slowly with wings rising well above horizontal, foot pattering. The fluttery wing beats while hovering to feed, with wings returning to nearly vertical, are the basis for descriptions describing the flapping as butterfly-like. Ashy Storm-Petrel: Ranges offshore from northern Baja to northern California. Especially common in Monterey Bay in fall. Medium size. Slightly rounded wing tips. Long, shallowly notched tail, often held up slightly in flight. Stiff, rapid, shallow wing strokes, not rising above the horizontal, has been likened to the flight of a bat. Commuting flight level and direct, but can have an erratic and twisting flight when flushed. Least and Black Storm-Petrels. Off San Diego, California. October 11, 2015. Greg Gillson. Least Storm-Petrel: Primarily Baja and southern California, rarely northward to Monterey Bay in fall, especially during warm water years. Small size. Short neck. Short, broad wing. Short, wedge-shaped tail; appears almost tailless in flight, bat-like. Commuting flight rapid, low, and direct with deep, but rapid wing strokes. Feeding, hovers in place with wings held high in a deep ‘V’ (Enticott and Tipling 1997). 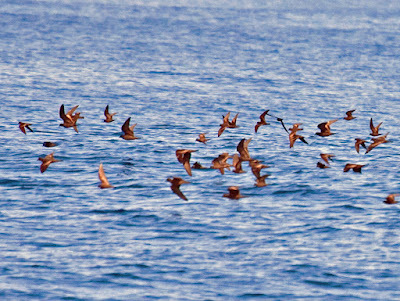 Wilson’s Storm-Petrel: Rare on West Coast, primarily in fall on Monterey Bay, in flocks of other storm-petrels. Medium size. Wings short and slightly rounded. Short square or rounded tail. Long legs extend behind tail in flight and often dangle down. Commuting flight low and direct with fluttering wing strokes, interspersed with steep upswoops (Stallcup 1990). Foraging, darts and skims and swoops over waves like a Barn Swallow. Feeding, hangs in air on open wings, foot-pattering on surface of water with long legs. Enticott, J. and D. Tipling. 1997. Seabirds of the World: the complete reference. Stackpole Books. Harrison, P. 1991. Seabirds: an identification guide. Houghton Mifflin Co.
Harrison, P. 1996. Seabirds of the World: a photographic guide. Princeton University Press. Naveen, R. 1982. Storm-petrels of the World: an introductory guide to their field identification. Parts I-IV. Birding vols. XIII, No. 6 and XIV, No. 1-4. Stallcup, R. 1990. Ocean Birds of the Nearshore Pacific. Point Reyes Bird Observatory.